As the Salty Dawg Rally and NARC participants left (schedules I guess? ), there was a large contingent of sailors who waited for a better window. It was a tough year to get a decent Gulf Stream weather window for a crossing, so many of us moved a bit south from Norfolk, VA to a better departure spot below Cape Hatteras at Beaufort, NC. One by one we gathered in the local pub called the Backstreet Pub, became friends and did what sailors do - shared weather strategies, etc. 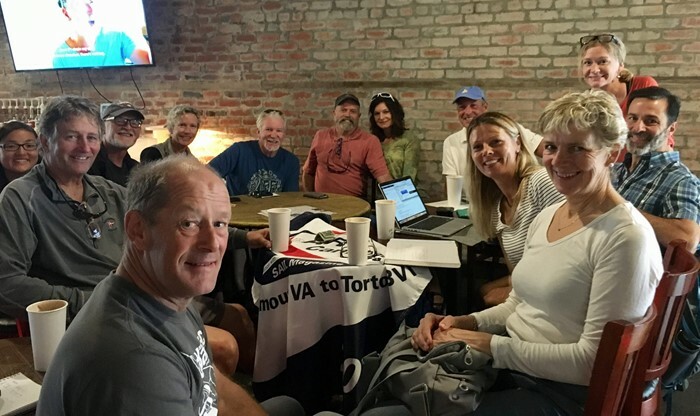 OCC Port Officer Dianne Tetrault and OCC members Andrew and Carolyn Bellamy s/v Askari from Australia and Anne and Jonathan Lloyd s/v Sofia from the UK all helped gather us together and we started the "Backstreet Bucaneers Rally", hats and all. We kept an SSB daily schedule along the way and as we neared our destinations, some to the USVI, others to the BVI. Of the 9 boats that left all arrived safely although a bit low on fuel. Trade winds were not to be seen but the fleet arrived between 7 and 12 days later. Safely. Askari and myself on Loon were OCC members and of course tried to do our part increasing membership. I believe after today I'll have 8 people and a dog called Marlon, our rally mascot, as new members. We continue to keep in touch and hopefully we can all get together soon for a group photo. The one here I posted on the Facebook group page before we left. Hope I haven't overworked your application site. Thank you for reviewing and hopefully accepting these fine people and qualified sailors to our club of which I'm proud to be a member .